“So, we hear air-pressure changes, or cycles – air pushing on our eardrums, and then letting up, and then pushing again. 40 changes in a second are really low bass notes. 15,000 changes in a second are really high treble notes. Midrange, where a lot of our voices happen, is around 300 cycles to 3000 cycles a second. When people talk about analog audio, they are talking about somehow duplicating this fluctuating air pressure in some way – the wavy surface of a vinyl record is one way to do it. A speaker’s job is to move back and forth and push on air, so that our eardrums detect air-pressure changes and our brains hear sound. We send a speaker an electrical signal which pulses (+) and (-), and that corresponds to the positive and negative pressure on our ears, and the air replicates that pressure and we hear sound. An amplifier takes a low-level electrical signal and amplifies it to better control the back-and-forth motion of the speaker, and to allow it to do its job even with loud passages, where lots of air has to be moved. If the speaker is low-performance, it distorts the sound by not following the signal well enough (no speaker is perfect, there’s always some variation, but the closer, the better). If the amplifier is poor in performance, it adds distortion to the signal. Especially if an amplifier tries to “punch out of its weight class” – to generate more power than it really can – it distorts fast. Historically, amplifiers are intended to be fair and amplify any note that comes through them just the same amount – no boosting of one note over the others. Nowadays, some amplifiers have the ability to shape or tune the sound signal, if properly set up (this capability usually lives in a box separate from the amplifier box, but now they are sometimes combined, like the old TV/DVD combo). So, “stereo” means solid, and it refers to recording music with two different channels – left and right – and then playing that recording back through left and right speakers, so that an illusion is created between them of musicians performing on a stage. Not all stereo recordings have this sort of “stereo image” in them, but most rock and jazz and folk recordings do (even studio recordings are engineered to create this illusion by the producer). So, a stereo stage refers to the arrangement of “virtual performers” as you listen, and the stereo “image” refers to the illusion that stereo is trying to create. It is worth mentioning at this point that sitting off-center wrecks a lot of this illusion. More on this later. 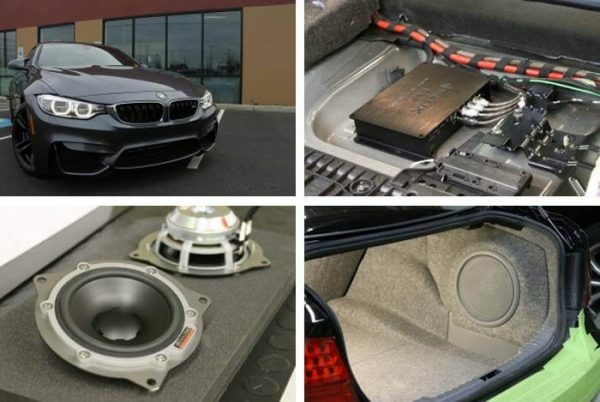 Your car has an BMW stock amplifier in the back driver corner of the car, under a trim panel. It has a single connector with a bunch of wires in it. We have an interface harness which plugs into this connector, and lets us access all the signal in and speaker output wires without cutting anything in the car. That lets us unplug the current amp and connect all those wires to the new amp. So the best sound upgrades have great speakers and a great amp, and a great source unit. Your BMW source unit isn’t bad, it’s the best part of the system you have right now. Your amplifier is low-performance, and your speakers are slightly better. Our Level One for your car replaces the stock amp with a more powerful amp, which also has some sound-shaping capabilities – which we use to best advantage. We keep the stock speakers, and tweak things to get them to sound as good as possible (which is much, much better than they sound now). Level Two is a good amp and *much* better speakers. Level Three is great speakers, a great amp, and some advanced signal tunability for us to use also built in. One kind of signal processing is called “equalization”, which lets us make certain notes louder or quieter so that all the notes are played back at an equal level. Another kind of signal processing is crossover filtering, which filters out notes from a given speaker so that the speakers don’t play notes they are not intended to play. A third kind, and much more rare until recently, is time-arrival correction (also called “time delay”). This corrects for the fact that the speakers in your car are various distances from your ears. Since sound travels relatively slowly, the sound from each speaker arriving at your ear at various times causes some problems – some sounds interfere with others in the air before they get to our ears, and the sound is blurred or smeared a bit. Time delay lets us correct for that, so we can make up for one of the biggest problems with music systems in cars – the speakers have to fit in various locations, and we sit off-center, each speaker a different distance away. The illustration below shows the woofer in the trunk, not under the seat as in your car, but the principle is the same – we want everything to seem as if it’s out on the stage, and we’re looking at the stage. So, Jack White is a madman about how his stuff is recorded. If you play any of his stuff on a good system, you can hear amazing detail and impact, and the intent of the artist comes through really well. Rock in general has bass guitar and real drum kits which can sound fake, or can sound real if the immediacy and attack of the instrument is duplicated closely enough. Finally, guitar can sound dull, as it does on most car systems, or it can sound real when the treble notes are clean and clear, without added distortion. That’s our goal.